Succeed experts focused on helping organizations successfully implement the new OSHA Hazard Communication Standard based on the Globally Harmonized System (GHS) for the classification and labeling of chemicals. According to the Department of Labor’s Occupational Health and Safety Administration (OSHA), nearly 70% of all OSHA violations involve the Hazard Communication Standard. 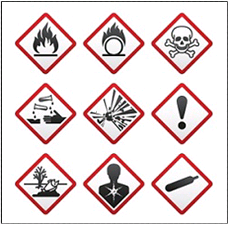 With the roll-out of the new GHS-based Hazard Communication Standard, organizations are tasked to implement major changes in hazard classification criteria, chemical labeling requirements, and universal Safety Data Sheet formats. Every organization with employees who work with hazardous materials must ensure their Safety Data Sheets are accurate and accessible. The most efficient and effective way to manage SDS’s is to use a digital database. The standard requires that organizations maintain an SDS for each chemical that is easy to access by all employees. Manual processes quickly fall out-of-date because many organizations don’t have the bandwidth to reliably keep SDS’s current and guarantee employee access, leaving them at risk of noncompliance. The Succeed Safety Data Sheet Service relieves an organization’s management burden with a turn-key solution managed by safety experts. Succeed manages the entire process: compiling SDS’s based on a client’s chemical inventory; checking for SDS updates from manufacturers and suppliers; delivering instant access to employees through SDS Track™; and providing for manual print-outs when needed by the organization. This Safety Data Sheet Service can save time and money because the SDS’s are securely stored, viewable online by employees at any location with a computer, and archived for future reference. Plus, this service helps the organization ensure they remain in compliance with OSHA regulations, thereby avoiding costly citations and fines. The Succeed Risk Management Center contains a suite of software applications that help manage claims and OSHA reporting (Incident Track™), behavior-based safety programs (BBS Track ™), hazard communication and Safety Data Sheets (SDS Track™), Return to Work programs (Job Description Track™), employee training (Training Track™), and third party insurance compliance (COI Track®). Succeed also offers support services, such as managing Certificates of Insurance, Safety Data Sheets, and creating custom training courses. More information on Succeed is available via their website.